Most people have heard of the Milky Way, but fewer have ever seen it. Fewer still understand what it is. September brings us more frequent clear night skies, and some great opportunities to observe this beautiful celestial structure. You’ll get your best view on a Moonless night. Wait until at least an hour after sunset, turn off any outside lights, and give your eyes time to adjust to the dark (20-30 minutes for most people). Rising like an arch, it spans the sky from the northeast to southwest horizon. Only about a quarter of its full extent can be shown in my graphic. Note that what is shown is not exactly what you’ll see (or don’t see). The gray areas are called isophotes and represent regions of equal brightness, sort of how lines on a topographic map show equal elevation. If your sky is clear and dark, what you’ll see is a sprinkling of myriad faint stars grouped more densely than in other areas of the sky. It looks a little like a cloud, and at one time was thought to be just that. But when Galileo trained his telescope on it, way back in 1610, he became the first to realize it was made of stars. The stars are so numerous and distant that their light blurs into a cloud-like glow. 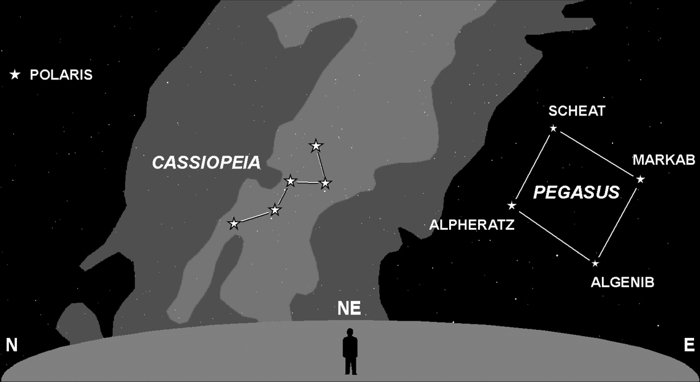 The distinctive constellation Cassiopeia, a.k.a. the “W,” is embedded in a brighter area of the Milky Way, so find the “W” and you will, sky permitting, also find the Milky Way. Unfortunately, for those who live in large metropolitan areas, light pollution has pretty much washed out this celestial wonder. Urban sky glow reduces the contrast significantly. Previous Previous post: Q&A: Lightning Hazard!